Somewhere in the perfume industry, someone’s dog must have eaten the Pantone memo about “Radiant Orchid” being the color of 2014. After last year’s pink wave, the“eau” concept is still going strong, but the chromatic scheme has switched to barely-there pastel hues of green, from almond to aqua. Green has been the house of Carven’s signature since it was founded in 1946. Under its new Jacques Bogart license, the brand hasn’t revived the spectacular green and white-striped folded-paper boxes treasured by vintage collectors. But it did relaunch the gardenia-centered green chypre Ma Griffe, whose original formula was restored by Francis Kurkdjian, who also authors the brand’s contemporary offerings. After last year’s Carven L’Eau de Parfum, L’Eau de Toilette is coming out in mid-April (with a premiere in late February in the Parisian concept store Colette). The juice is linden-tea green, but Francis K. says he worked on the idea of “whiteness”. This translates into a moist-petals, neo-aquatic floral, with a melon-y note gradually blending into a faintly spicy, abstract bouquet. Francis K. also signs Elie Saab’s second fragrance. 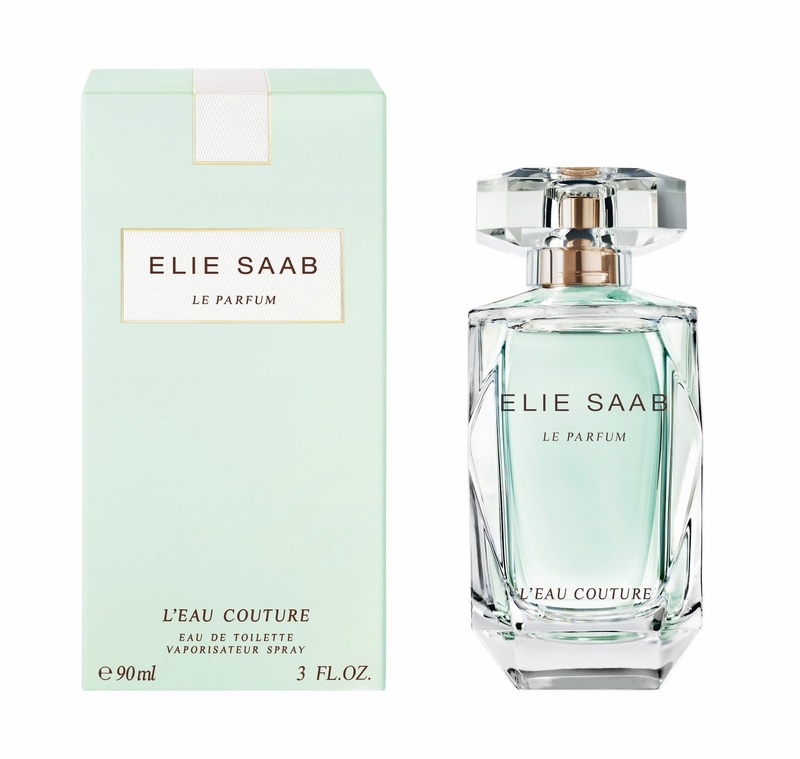 This time, the green theme is given a delicately gourmand twist, based on the faint whiff of fresh almond given off by budding orange blossoms – Saab’s signature note. There is, again, a minute drop of the aquatic in the rosy-lemony magnolia accord; the gourmand base is very elegantly executed, with a fresh, radiant vanilla bolstering the raw almond, and a lovely cosmetic vibe throughout. 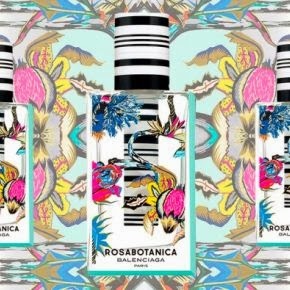 This year’s variation on Balenciaga’s Florabotanica by Oliver Polge and Jean-Christophe Hérault, isn’t actually green (though the background to the floral pattern on the box is a fetching shade of aqua). But its deconstructed sci-fi rose, laced with aromatic, almost medicinal effects – from the mint and rosemary facets of cardamom – seems to have been plucked from an herbalist’s off-world garden. Those green notes, which Hérault explains are actually present in roses, tie in with the woody vetiver base through another vibe of green, fig leaf. This is the most engagingly weird, modernistic roses in the mainstream – or even in niche, for that matter. And one that very intelligently solves the mainstream budget vs. “natural notes claim” conundrum by not actually aiming at something that’s recognizably a rose. Out in early March, Michel Almairac’s new fragrance for the Italian house (Coty-produced like the Balenciaga) also straddles the fragrant/herbal/medicinal boundary. Since it is pitched as a modern interpretation of eau de Cologne, which was sold as a cure and a tonic in the 18th century, the option makes some sort of historical sense. Like Rosabotanica, it associates rose with a terpenic, citrusy-aromatic spice – this time, coriander – so that the two scents have a similar vibe. 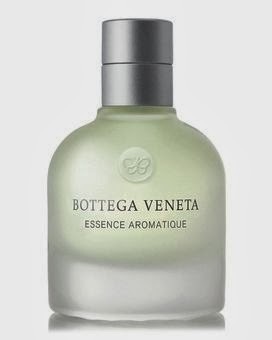 In Essence Aromatique, the accord is set between bergamot and a whiff of airy « driftwood » amber, in keeping with the “lounging on the Adriatic coast in a $600 swimsuit” inspiration (not necessarily a bad investment: I bought two Tomas Maier swimsuits on sale ten years ago and I’m still treasuring them). I’m also reminded, though I don’t have it at hand to compare, of Clarins’ cult Eau Dynamisante, itself a reinvention of cologne with a “good for your body and mind” claim. 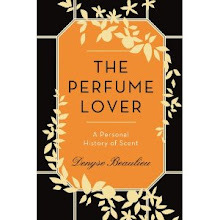 It’s interesting to note that all of these brands have taken the Prada route of working with an “appointed” perfumer: Francis Kurkdjian for both Carven and Elie Saab, Oliver Polge and Jean-Christophe Hérault for Balenciaga (though the former’s new position at Chanel and Nicolas Ghesquières’s ousting may change that), and Michel Almairac for Bottega Veneta (he is also attached to the Chloé rose franchise, another Coty license). 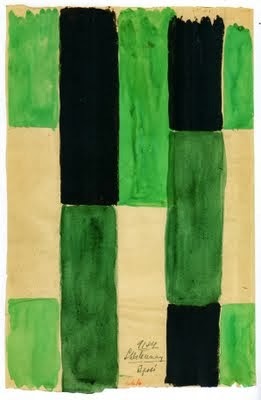 Top picture by Sonia Delaunay, 1924, sourced from a lovely decoration blog I've just discovered, Painting Box. Isn't it lovely? Would make a nice Prada-ish coat too, I bet. Green is the new green again, can not wait to use my MMM Untitled again! Btw, smelled new Prada Candy Florale at the duty free, it supossed to come to normal shops soon as well! Ela, there's just a craving in late winter for those green notes, isn't there? I love Untitled as well, it's a pity its lasting power is so poor on me... My decant is getting low! You know, Denyse, some days you can be so cruel. 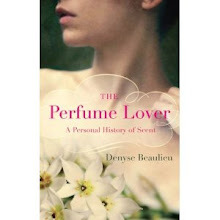 The windchill in Montreal is - 22 deg C. There is snow and ice everywhere and here you are talking about lovely green, spring scents. A great big "thank you!". P.S. Kurkdjian's restoration of Ma Griffe is making my mouth water! But you know me.. I've always been a sucker for green chypres. Normand, isn't that just the moment when you'd need a whiff of green for therapy? The new Ma Griffe is, as was to be expected, a little "slimmed down" and less mossy. They swear it's the same formula though.